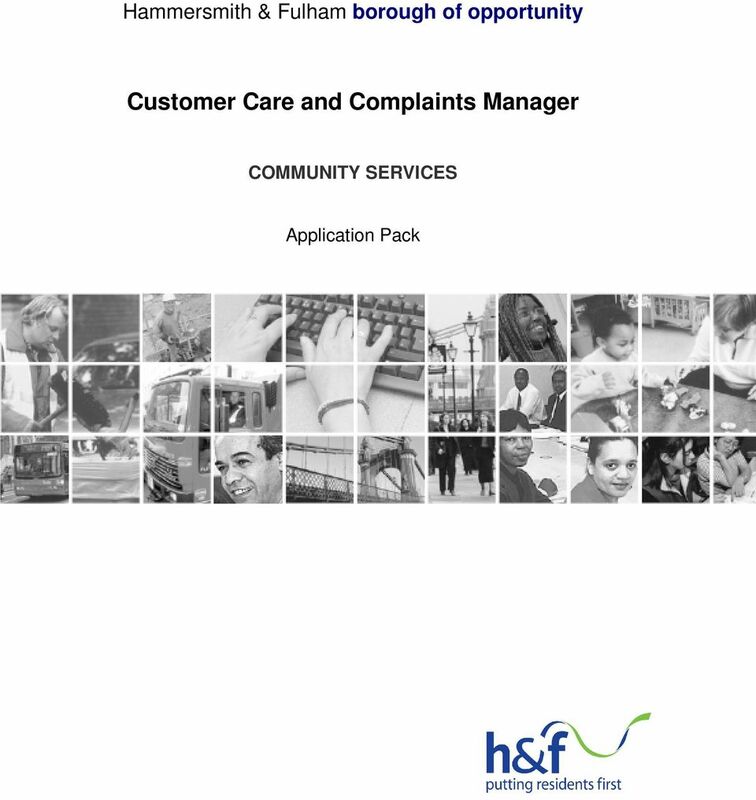 Download "Customer Care and Complaints Manager"
5 appropriate, advising senior managers on appropriate forms of redress where complaints are upheld. 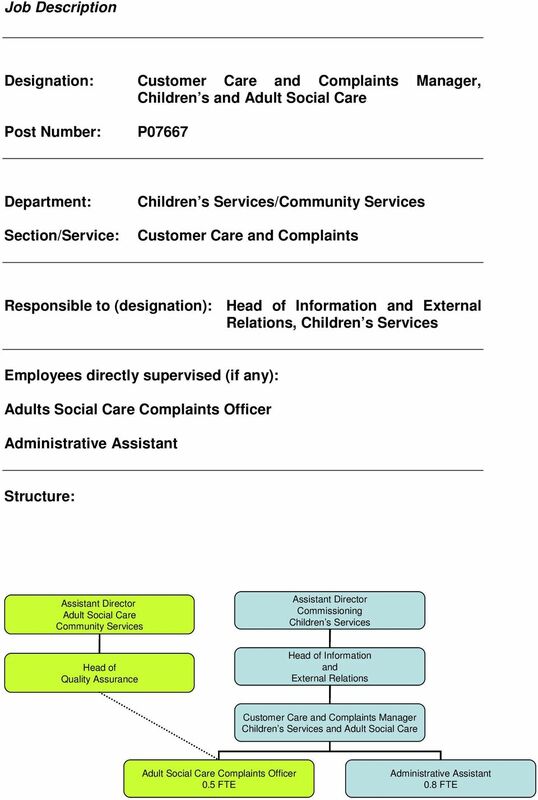 5 To liaise with managers at all levels so as to effect the satisfactory resolution of complaints including in particular the Directors of Children s Services and Community Services, Assistant Directors, Heads of Services, Service Managers and other managers, as well as the Chief Executive s Office. 6 To establish, develop and promote effective working relationships with Quality Assurance Managers in children s services and adult social care so as to ensure that complaints are utilised as a service improvement tool. 7 To promote the principles of mediation and other forms of alternative dispute resolution in resolving complaints and concerns as close to the point of contact as possible. 8 To deliver training and ensure that there is clear information available for staff, service users, and residents about the application of different complaints procedures. 9 To ensure adequate guidance is available to business unit staff through the production and maintenance of documented procedures and processes supported by relevant training. 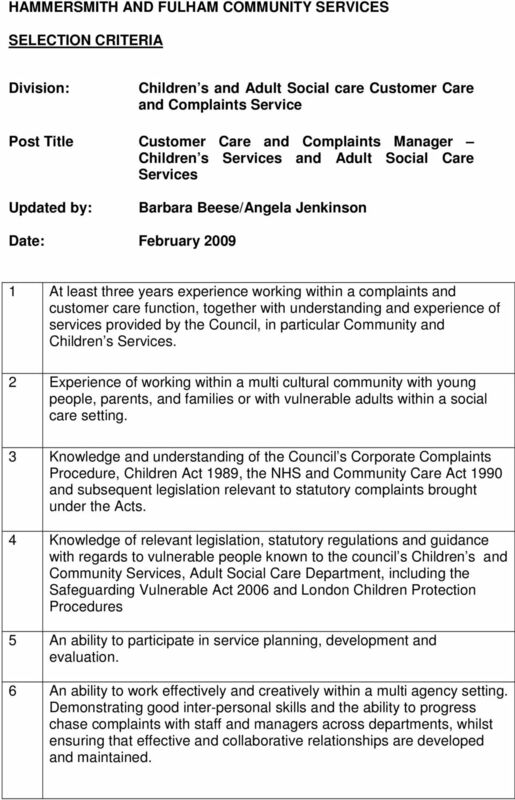 10 To be responsible for ensuring that all hard and electronic information pertaining to customer care and complaints for children s services and adult social care is up to date, including on the council s website and the intranet with school, in keeping with relevant information sharing protocols, including the principles of confidentiality. 11 To use the Council s office-based and mobile IT services for the input, access and transmission of information using the appropriate level of information security and classification through the use of electronic mail, diaries, word-processing, spreadsheets and databases as well as any specific job-related applications as required to carry out the duties of the post 12 To ensure the Council s data quality and information rights compliance by managing the administration of information, application systems, technology and staff so that the business unit complies with the Council s Information Management related policies. 13 During audits, to be able to demonstrate compliance with policies by the production of satisfactory supporting evidence. 6 14 To understand and be conversant with Child Protection and Safeguarding Adults policy and practice and to liaise on such matters with Quality Assurance Managers in children s services and adult social care as necessary. 15 To establish a pool of appropriately trained persons to support and facilitate the complaints function, paying due regard to the support needs of vulnerable users regarding any information, support and advocacy needs, commissioning independent investigations as necessary. 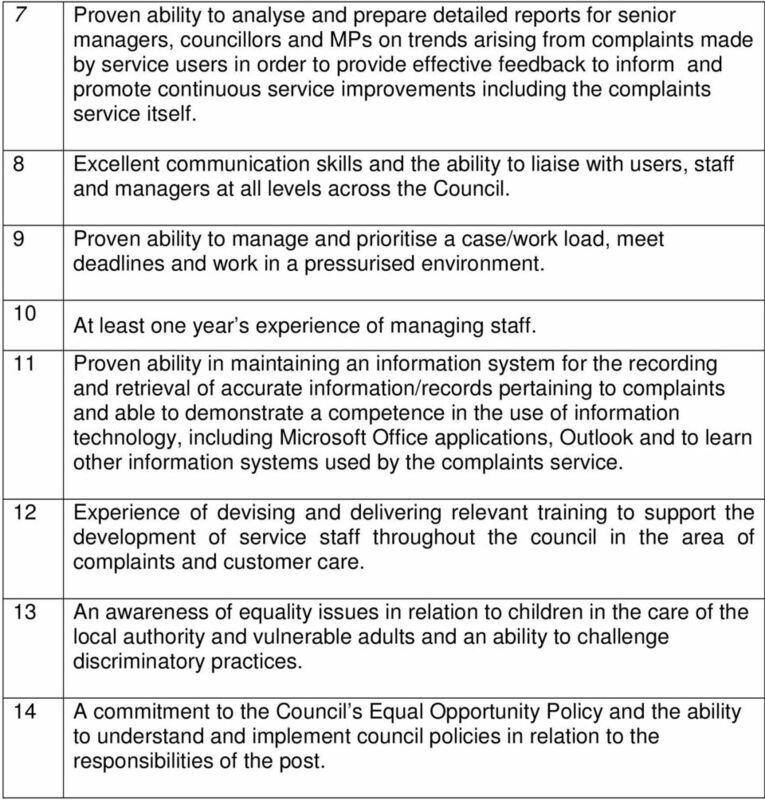 16 To develop good management information systems and provide an analysis of local policy, practice and performance and identify trends in respect of complaints and customer care as may be required by children s services and adult social care service managers and departmental plans. 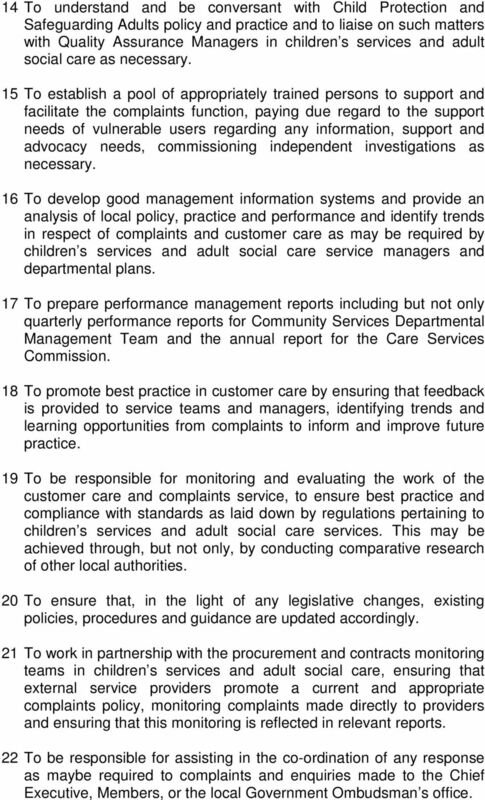 17 To prepare performance management reports including but not only quarterly performance reports for Community Services Departmental Management Team and the annual report for the Care Services Commission. 18 To promote best practice in customer care by ensuring that feedback is provided to service teams and managers, identifying trends and learning opportunities from complaints to inform and improve future practice. 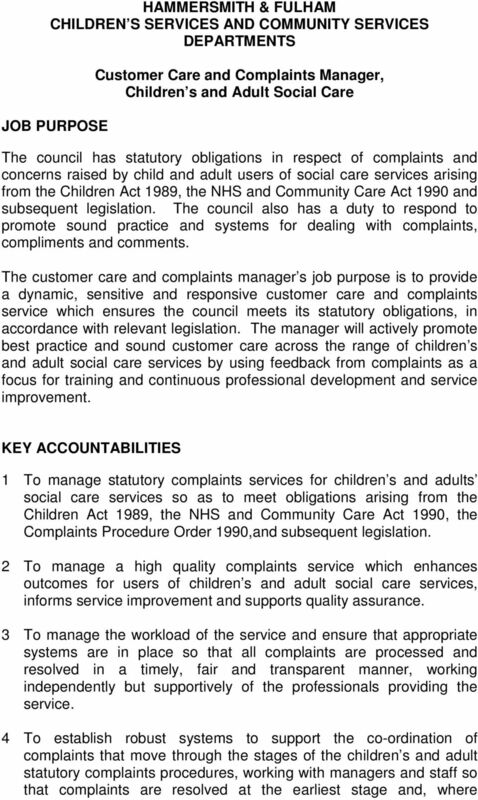 19 To be responsible for monitoring and evaluating the work of the customer care and complaints service, to ensure best practice and compliance with standards as laid down by regulations pertaining to children s services and adult social care services. This may be achieved through, but not only, by conducting comparative research of other local authorities. 20 To ensure that, in the light of any legislative changes, existing policies, procedures and guidance are updated accordingly. 21 To work in partnership with the procurement and contracts monitoring teams in children s services and adult social care, ensuring that external service providers promote a current and appropriate complaints policy, monitoring complaints made directly to providers and ensuring that this monitoring is reflected in relevant reports. 22 To be responsible for assisting in the co-ordination of any response as maybe required to complaints and enquiries made to the Chief Executive, Members, or the local Government Ombudsman s office. 7 22. To establish, promote and develop effective relationships with the Senior Designated Officer for allegation against adults, ensuring allegations are dealt with timely and consistently in accordance with the London Child Protection Procedures and relevant government guidance. 23 To provide robust line management in accordance with the council s human resources policies and procedures, including recruitment, regular supervisions, team meetings and appraisals that are timely and will generate team and service action plans with training profiles. 24 To attend meetings as will be required by managers concerning support, supervision and performance in order to improve service delivery and further professional development. 25 To attend relevant meetings, conferences as may be relevant to the professional requirements of the post. 26 To manage any delegated budgets that support the functions of the post, in accordance with the Council s financial procedures. 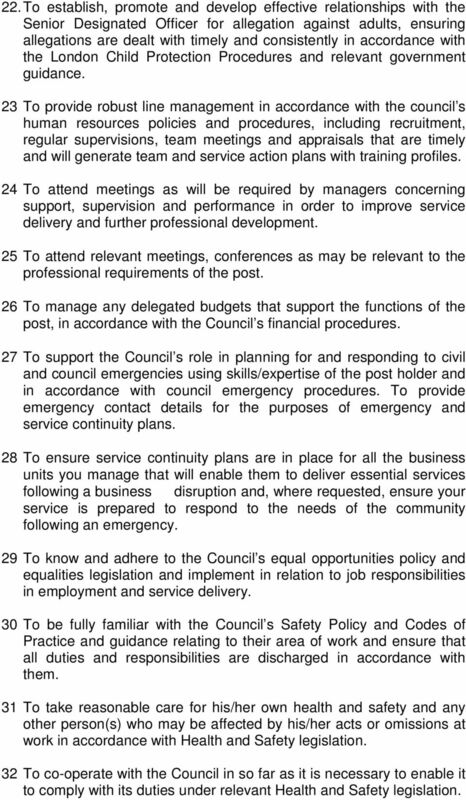 27 To support the Council s role in planning for and responding to civil and council emergencies using skills/expertise of the post holder and in accordance with council emergency procedures. To provide emergency contact details for the purposes of emergency and service continuity plans. 28 To ensure service continuity plans are in place for all the business units you manage that will enable them to deliver essential services following a business disruption and, where requested, ensure your service is prepared to respond to the needs of the community following an emergency. 29 To know and adhere to the Council s equal opportunities policy and equalities legislation and implement in relation to job responsibilities in employment and service delivery. 30 To be fully familiar with the Council s Safety Policy and Codes of Practice and guidance relating to their area of work and ensure that all duties and responsibilities are discharged in accordance with them. 31 To take reasonable care for his/her own health and safety and any other person(s) who may be affected by his/her acts or omissions at work in accordance with Health and Safety legislation. 32 To co-operate with the Council in so far as it is necessary to enable it to comply with its duties under relevant Health and Safety legislation. 8 33 To be responsible for, under the direction of the Assistant Director, the risk assessment of officers health and safety within their service area whilst at work and any other person s health and safety who may be affected by this undertaking for the purpose of identifying the measures they need to take to comply with the requirements and prohibitions imposed upon him/her by or under the relevant statutory provisions, regulations, approved code of practice and guidance. 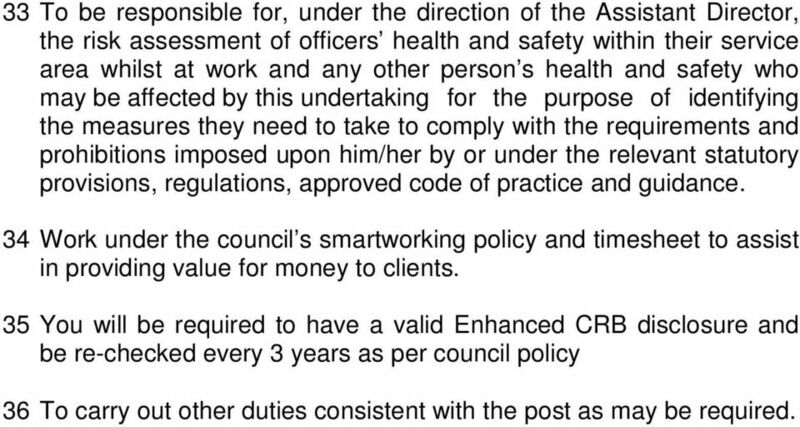 34 Work under the council s smartworking policy and timesheet to assist in providing value for money to clients. 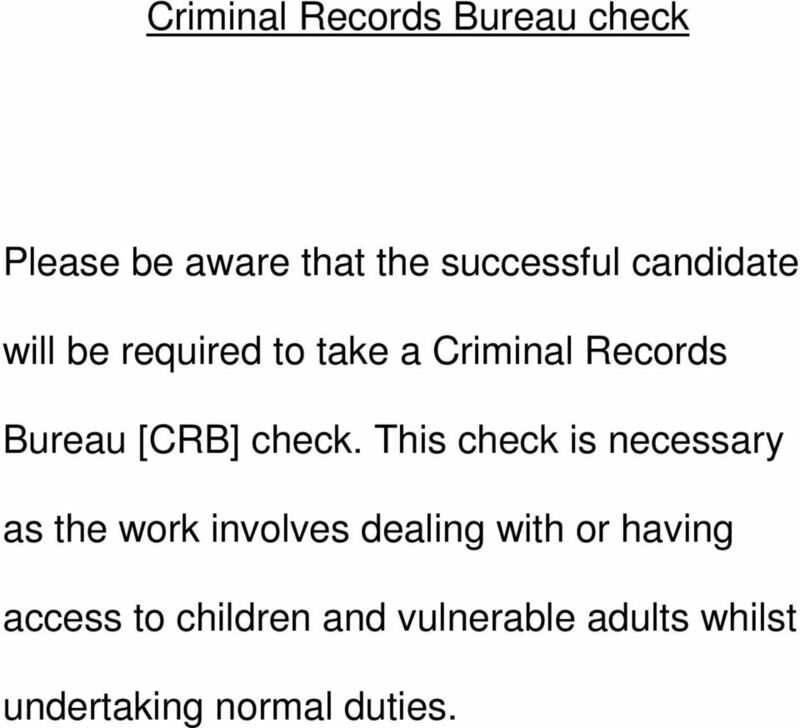 35 You will be required to have a valid Enhanced CRB disclosure and be re-checked every 3 years as per council policy 36 To carry out other duties consistent with the post as may be required. 9 HAMMERSMITH AND FULHAM COMMUNITY SERVICES SELECTION CRITERIA Division: Children s and Adult Social care Customer Care and Complaints Service Post Title Customer Care and Complaints Manager Children s Services and Adult Social Care Services Updated by: Barbara Beese/Angela Jenkinson Date: February At least three years experience working within a complaints and customer care function, together with understanding and experience of services provided by the Council, in particular Community and Children s Services. 2 Experience of working within a multi cultural community with young people, parents, and families or with vulnerable adults within a social care setting. 3 Knowledge and understanding of the Council s Corporate Complaints Procedure, Children Act 1989, the NHS and Community Care Act 1990 and subsequent legislation relevant to statutory complaints brought under the Acts. 4 Knowledge of relevant legislation, statutory regulations and guidance with regards to vulnerable people known to the council s Children s and Community Services, Adult Social Care Department, including the Safeguarding Vulnerable Act 2006 and London Children Protection Procedures 5 An ability to participate in service planning, development and evaluation. 6 An ability to work effectively and creatively within a multi agency setting. Demonstrating good inter-personal skills and the ability to progress chase complaints with staff and managers across departments, whilst ensuring that effective and collaborative relationships are developed and maintained. 10 7 Proven ability to analyse and prepare detailed reports for senior managers, councillors and MPs on trends arising from complaints made by service users in order to provide effective feedback to inform and promote continuous service improvements including the complaints service itself. 8 Excellent communication skills and the ability to liaise with users, staff and managers at all levels across the Council. 9 Proven ability to manage and prioritise a case/work load, meet deadlines and work in a pressurised environment. 10 At least one year s experience of managing staff. 11 Proven ability in maintaining an information system for the recording and retrieval of accurate information/records pertaining to complaints and able to demonstrate a competence in the use of information technology, including Microsoft Office applications, Outlook and to learn other information systems used by the complaints service. 12 Experience of devising and delivering relevant training to support the development of service staff throughout the council in the area of complaints and customer care. 13 An awareness of equality issues in relation to children in the care of the local authority and vulnerable adults and an ability to challenge discriminatory practices. 14 A commitment to the Council s Equal Opportunity Policy and the ability to understand and implement council policies in relation to the responsibilities of the post. 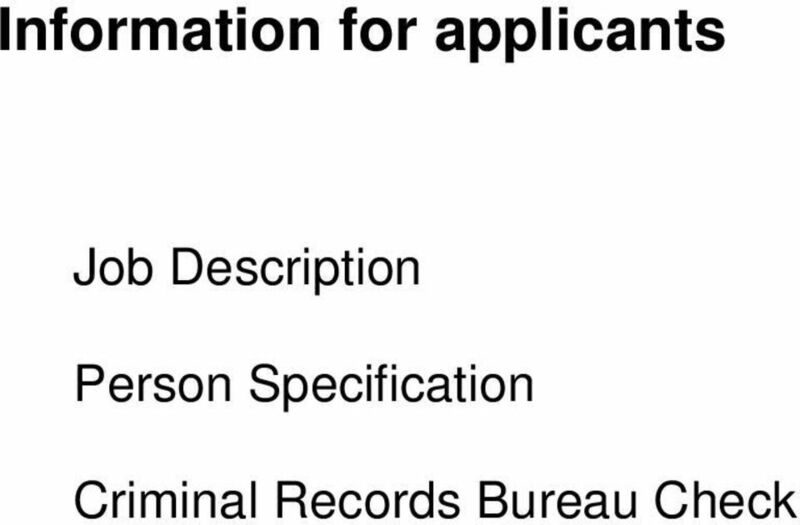 11 Criminal Records Bureau check Please be aware that the successful candidate will be required to take a Criminal Records Bureau [CRB] check. This check is necessary as the work involves dealing with or having access to children and vulnerable adults whilst undertaking normal duties. Any job offer is subject to DBS approval, undertaking child protection training and satisfactory references.